The MeT department has predicted that Chennai will remain cloudy while in other parts of Tamil Nadu and Puducherry, it would continue to rain. Amid intermitten rains, Chennai airport would resume operations today. Schools will remain shut. Rescue operations are on. 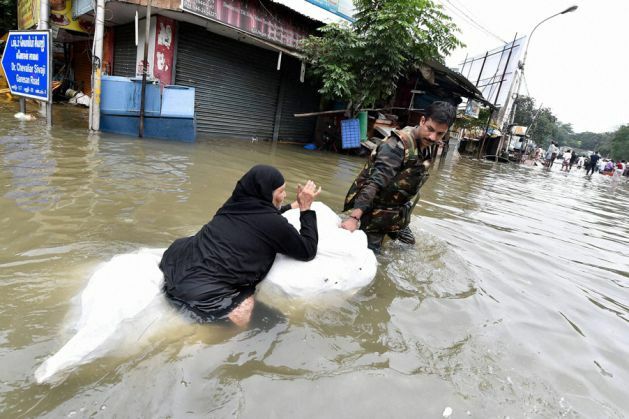 Flag Officer Commanding-in-chief of the Eastern Naval Command (ENC), Vice Admiral Satish Soni on Saturday said that Chennai city is returning to normalcy at a very fast rate. Agriculture and fishing activities have taken a serious hit because of the incessant rains. Read on what could be the quantum of loss. The Met department on Saturday said that the rains are likely to continue in the coastal parts of Tamil Nadu even though its intensity would be less, hinting that weakening of low pressure area in the region might bring some relief from relentless showers. Regional Meteorological Director S R Ramanan said that Chennai is likely to remain cloudy. Why is it raining in Tamil Nadu? "Yesterday's low pressure area over Sri Lanka and North Tamil Nadu coast has weakened into a trough of low pressure which is now lying over Sri Lanka and adjoining areas of Tamil Nadu coast. Because of this trough it has rained at many places of Tamil Nadu and Puducherry," Ramanan said. "As far as forecast for next 24 hours is concerned, it is likely to rain at many places in Tamil Nadu and Puducherry, with some areas likely to experience heavy rainfall," he added. Though water has begun to recede from many submerged areas, many more still remain flooded, necessitating the rescue teams to continue to work on a war footing. Two Naval vessels INS Shakti and INS Shyadhri arrived Chennai on Friday with relief materials, while limited air services were offered from the naval airbase at INS Rajali at Arakkonam, some 85 km west of Chennai. With the water receding, the Chennai airport is expected to be operational for regular air services from Saturday. The outflow of water from the Chembarampakkam reservoir and Poondi Lake in Tiruvallur district, which caused inundation in many South Chennai areas, is kept to the same level. The district administration has announced that all educational institutions will remain closed on Saturday. Farmers expressed fear that around 75 thousand acre paddy fields were facing the danger of submerging if rain continued unabated for a few more days. Fishing activity came to a standstill as the sea is very rough in the delta district of Nagapattinam.